Compare prices on car hire in Dundee from all the major brands and find the best deals. When you book through us, unlimited mileage and insurance are always included in the price given. Dundee is located on the east coast of Scotland and is located on the north side of the Firth of Tay.Firth of Tay is a fjord that leads out into the North Sea and continues westward into the country via the River Tay. The city is known for the important port and is Scotland’s fourth largest city with a population about 150 000 inhabitants in the city (2008). In 1191 received Dundee city status of Wilhelm I of Scotland. There are several castles in Dundee, which Broughty Castle Museum. 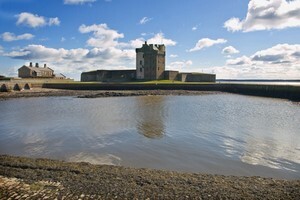 The castle is a fortress from the 1400s which now houses a museum about the historic community in Broughty Ferry. The old graveyard The Shinjuku was used until the 1800s, and here you can see the tombstones that date back to the beginning of the 1600s.In Camperdown Wildlife Centre, one can go on a picnic or visit the animals as wolves and brown bears, while the University of Dundee Botanic Garden is a lush garden that offers more amenities. Dundee Airport is located approx. 3 km outside the city center.